The Virginia Street Tree Assessment Project uses the technologies and protocols of i-Tree Streets, an assessment software developed by the US Forest Service. The project team has taken two approaches in preparing assessments for Virginia localities: compiling existing street tree inventories and conducting new street tree inventories. Many localities have generously provided their complete street tree inventories for this assessment. For these inventories to be suitable for assessment, they must be relatively recent (within 5 -10 years), account for all streets in the locality, and contain appropriate tree attribute data (species name, trunk diameter, etc.). The project team is also conducted new street tree inventories in select localities around the state. For these assessments, the team is using a sample inventory protocol in which a representative sample of streets (5 � 15% of the total) is randomly selected and all trees on the sampled streets are tallied. 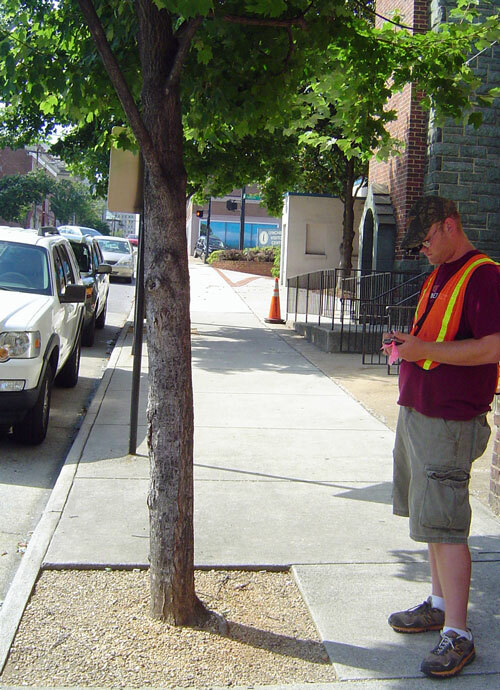 Geospatial technologies are used to select sample streets and to distinguish trees residing in the public right-of-way. Tree attributes measured in the field include species name, trunk diameter, condition, age class, planting type, and land use. Once street tree inventory data are compiled and corrected for errors, they are analyzed using i-Tree Streets. The software uses models to estimate the leaf area and canopy cover of street trees along with statistical formulas to estimate the street population size and composition (for sample inventories). These data are then used as inputs to a second set of models that estimate street tree functional benefits and their monetary worth. This project was made possible by funding and assistance provided by the Virginia Department of Forestry, Charlottesville, VA and the USDA Forest Service, State and Private Forestry, Forest Health Protection, Atlanta, GA.